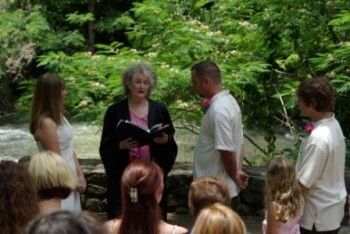 Hot Springs Wedding Ministry will be happy to help you select the perfect location for your memorable wedding day or renewal of vows- regardless of the size of your wedding party. We consider a small, intimate wedding to be just the two of you…. OR as many as 20 total with you and your guests. Wedding venues can be arranged for wedding parties of up to 100. We will help you choose an ideal location…..an historic church, a quaint chapel or intimate gazebo, natural springs gardens, lakeside, private home setting or a mountainside overlook…. perfect memories for your small wedding or intimate renewal of vows. Two of the most popular wedding sites in the Hot Springs area include Garvin Woodland Gardens (home of the renown Anthony Chapel) and the famous, historical Arlington Park Hotel on Central Avenue. Click here for more location information.